The Latin plant name of lettuce, Lactuca Sativa, describes a cultivated plant (sativa), which has some milky liquid (lactuca) in its stems. 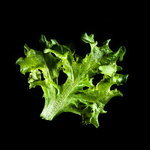 Who would think that lettuce is a very old plant: that the ancient Egyptians were already cultivating 4000 years ago? The Romans adopted the gardening habit, probably encouraged by the fresh taste and their belief that lettuce would enhance their performance during tempus amoris. There’s an interesting clash between two beliefs here: the Anglo-Saxons called a wild cousin of lettuce ‘sleepwort’ because it had mild narcotic properties. Maybe it’s a question of skilful timing? The lettuce is a leafy plant with many variations. The Sweet Blond belongs to the loose-leaf varieties, meaning that it doesn’t form a head. It’s a decorative baby lettuce with a sweet, mild, fresh taste. The crisp, light green leaves have pretty fringed edges. Sweet Blond grows fast, so you’ll always have something nice to garnish your cold and warm salads with. Put it in sandwiches too for some cheerful crunch and sprinkle it on pizza or savory pies.